In her latest, compelling collection of prose poems, Michelle Reale redefines the elegy for the 21st century: less of a dirge, more of a sui generis periplus from “Genesis” to “Mythos”, around “Lament”; a celebration of personal and transmitted recollections with stirring nuances of meditative homage to femaleness and its challenges. She gives us a sentient poetry of bloodline, penned with grit, subtle melancholy, and acute sensitivity to a beckoning destiny marked by sacrifice, longing, and resilience. Not surprisingly, this work bring us closer to a full circle, to the original Latin mythological elegy. “And thus begins the cycle’’ of a woman’s life, too— in the quagmire of tradition and recurring submission, “translated and negotiated for your mother who never left the house”. 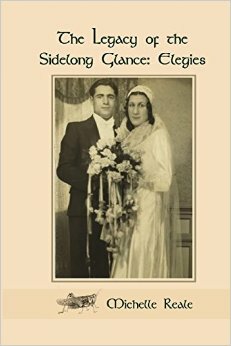 In a sense, “The Legacy of the Sidelong Glance” reads like a single, fluid, deeply moving chronicle-poem.The vein of realism that runs through Italian-American poetry, and the poetry of Italian roots, is amply supplied through Reale’s words. “Marriage takes him away first. Your true ally. But before even that, you lost him twice: once to the army and again to your sister’s house the one who offers him shelter so that your husband will not kill him. As if it was not his own flesh and blood. Let him go “Lasciarlo andare”, your husband tells him with jealousy. And he goes. (...) You learned surrender to save yourself. The first telegram arrives, signed just like his frequent Hallmark cards used to be: Forever, your loving son. You hang your heart by the hook near the door. The blood congeals on the floor below, sticky beneath your sensible shoe.” (Unto the Breach) Indeed, Cine-verità in a poem. Although rooted in the Italian experience, Michelle Reale’s poetic discourse reaches far beyond ethnic confines, to illuminate the universal female condition. The lasting impression is that of an enchanted mirror meant to be revisited again and again, in which “a woman’s lament” is reflected, acutely and lucidly and relentlessly.